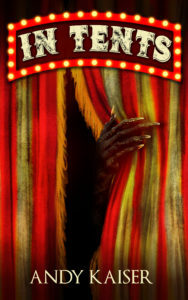 In Tents is available in paperback and ebook. Audiobook is in production and coming soon! Dario may not have his life figured out, but at least he has a job, a cell phone, and friends who care about him. That’s enough, until the circus comes to town. Soon after, a bloody attack puts his friend in the hospital and Dario begins to hunt for whoever is responsible. As he investigates, Dario is pulled toward the dangerous and violent circus, its strange people, and the dark rumors of “Frank’s Show”. But the more he unravels the mystery, the more he realizes he must escape it all… before it kills him.